Meghan Markle, who rose to fame as an actress, visited a nursing home in Twickenham, England, Tuesday that cares for people who have worked in the entertainment industry. Meghan, the Duchess of Sussex, met elderly residents and enjoyed carols around a Christmas tree at Brinsworth House, a nursing home for the Royal Variety Charity. She also joined the residents in decorating Christmas cards, artfully writing her name and a "Merry Christmas" message on one ornament. The Duchess joins residents decorating Christmas cards at Brinsworth House ?? Meghan spent time teaching calligraphy at a Paper Source store in Beverly Hills in her early years of acting. Meghan, who is expecting her first child with Prince Harry in the spring, told one resident she felt "very good" and "very pregnant." Meghan learned about Brinsworth House when she and Prince Harry attended the Royal Variety Charity's gala event, the annual Royal Variety Performance, in November. Money raised by the Royal Variety Charity, including its gala event, helps to support hundreds of retired entertainers throughout the U.K., according to Kensington Palace. 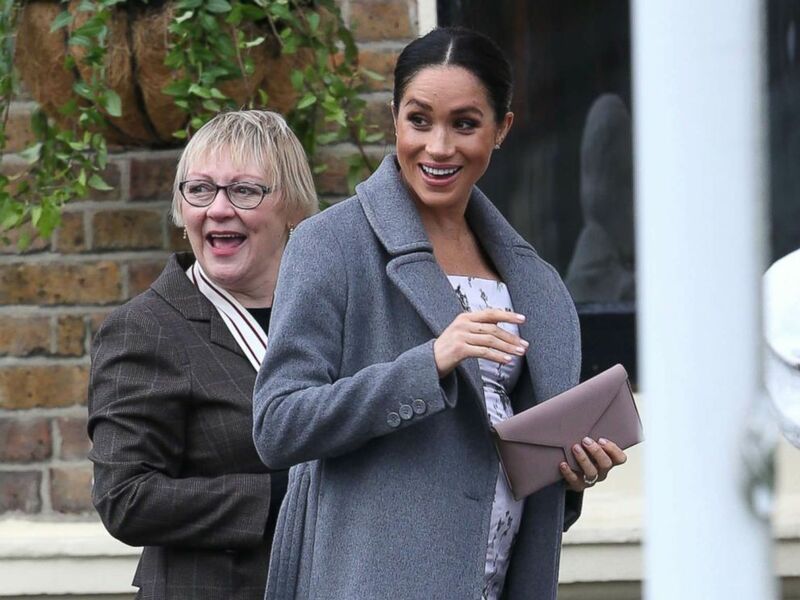 Meghan, wearing a Soia & Kyo coat and dress by the California-based Brock Collection, visited Brinsworth House on behalf of Queen Elizabeth II, who is a patron of the Royal Variety Charity. Meghan Markle, The Duchess of Sussex, leaves after visiting the Royal Variety Charity's residential nursing and care home Brinsworth House, London, Dec. 18, 2018. There are new reports that Meghan, 37, will receive her first royal patronage from Queen Elizabeth in the New Year. "She's been having meetings behind the scenes to find out more about the charities and organizations that she's considering becoming patron of," ABC News royal contributor Victoria Murphy said of Meghan. "She is very interested we know in women's and girls' rights around the world." She added, "We also know that she's interested in education and equality of education for all, and we know that, with her background as an actress, she is very interested in the arts." Meghan spent seven seasons playing an attorney on the TV series "Suits." Meghan and Harry’s relationship developed as she was starring on “Suits” and living in Toronto, where the show is filmed. Meghan Markle, Duchess of Sussex visits the Brinsworth House in Twickenham, London, Dec. 18, 2018. Meghan, a California native, grew up in the acting industry. Her father, Thomas Markle, from whom she is now estranged, is a retired Hollywood lighting director who worked on TV shows, including "General Hospital" and "Married With Children." Markle spoke out Monday in a TV interview about his relationship with Meghan, his only child with his ex-wife, Doria Ragland. He said he has not heard from Meghan, adding, "All I can say is that I'm here. She knows it, and I've reached out to her and I need her to reach back to me." Kensington Palace has not commented on the interview, according to Murphy. "There's been no reaction of course from Meghan or from Kensington Palace to the Thomas Markle interview," she said. "They have never commented on any of the interviews that he's given before so it's not something that they're going to start doing."